The critical importance of bringing women into peace-building in a transformative way is still not part of the worldview of the majority working in this area. All too often "women, peace and security" investments are perceived as luxuries or marginal after-thoughts. 'Peace' word written with pebbles on the sand. Aged photo. 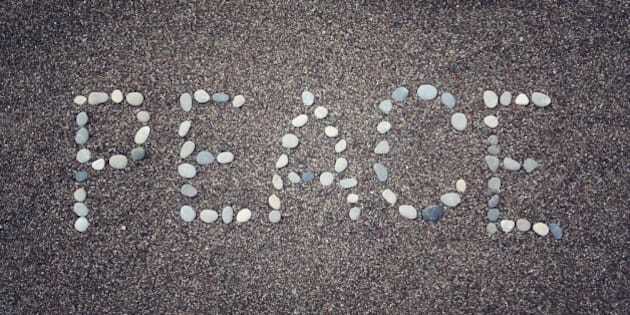 'Peace' word made by small stones on the beach. Word on the sand - toned photo. Antalya Province, Turkey. Wide photo for site slider. On July 1st, we marked the 100th anniversary of the Battle of the Somme. The tragic slaughter of hundreds of thousands of young men echoes through the century. I am Canadian because of my Scottish grandmother who turned 19 the year World War I ended. She looked around and saw that 'there were no young men left.' So she made a new life in western Canada. Fast forward 100 years. Armed conflict has changed. The line between combatants and civilians is blurred. Today suicide bombers attack airports and cafes. Armed groups abduct young schoolgirls. Sexual violence is an all too common military tactic. Population displacements are at an all-time high. Casualties in countries like Syria continue to mount, where some estimates put the death toll at just under half a million people. War has changed: our approaches to building peace must also change. Understanding the gender dimensions of armed conflict, security and building peace is crucial for the International Assistance Review. Women's empowerment and gender equality are strongly linked to peaceful and stable societies. The evidence is clear. Women's empowerment and gender equality are strongly linked to peaceful and stable societies. When they can set their own agendas, women's organizations have been successful at moderating violent extremism. Peace agreements are more likely to be reached and to stick when there is meaningful participation from women's movements. Women's organizations mobilize across ethnic, political and religious divides, building bridges for peace. The argument is not that all women are peaceful. But there is clear proof that women's organizations and movements have been and can be powerful tools in building sustainable peace. Yet there is resistance from the security sector in general and from pockets within the Department of Global Affairs in particular. Policy frameworks and analysis are generally silent on gender dimensions. The critical importance of bringing women into peace-building in a transformative way is still not part of the worldview of the majority working in this area. All too often "women, peace and security" investments are perceived as luxuries or marginal after-thoughts. We have heard from Global Affairs Canada officials that applying a feminist lens to our international development program involves "bringing women and girls into the heart of what we do." Nowhere is this more relevant than development assistance that aims to contribute to peace and security. Putting Canada's stated support for women, peace and security objectives into practice will require more than rhetorical statements. It involves strengthening our analysis of how gender inequalities and roles contribute to armed conflict and how addressing these issues actually helps drive peace. It includes strengthening analytical capacity - inside the department and in Canadian civil society. It includes mobilizing political capital to bring these issues into the mainstream of policy formulation, mediation, negotiations and diplomacy. And it involves making smart financial investments: supporting women's meaningful participation in peace processes and decision making, responding to and preventing conflict-related sexual violence, and ensuring women benefit from post-conflict economic recovery initiatives. Will we back our claims to support women as agents of change with significant, predictable and long-term funding? A crucial dimension is support for local or grassroots women's rights organizations and women peacebuilders. These organizations are doing brave frontline work, yet they are often neglected by the international community. During recent hearings of the House of Commons Standing Committee on Foreign Affairs and International Development, civil society organizations were unanimous in urging the Government to listen to and fund women's grassroots organizations, women's human rights defenders and women's peace organizations. Yet early signs are disappointing. In the new programs announced during Minister Bibeau's recent trip to Colombia, there was no funding for women's rights organizations, no direct funding for women peacebuilders and no specific initiatives to address 'women, peace and security` issues such as conflict-related sexual violence. Women's organizations played a fundamental role in bringing the Colombian peace process to where it is now. Canadian support to the women's movement during this delicate period would have been a powerful signal. If women and girls truly are a "key piece of the peace and development puzzle" as Minister Bibeau wrote recently in the Globe and Mail, then we must fund their organizations, defend their rights and support their activism. Beth Woroniuk is Coordinator of the Women, Peace and Security Network - Canada. The views expressed are those of the author, and do not necessarily reflect the views of CCIC, the WPSN-C or their members.